A recent study done by Clorox aimed to find the most germ-ridden surfaces in the workplace. The surface would be a “high-touch” area, meaning it was touched frequently by workers nearly all day long. 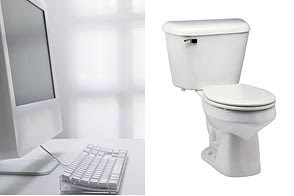 Remarkably, toilet seats were found to be one of the cleaner surfaces, but telephones and computer keyboards were found to be some of the most filthy. There are several obvious factors at play here. The more often something is touched, the more germs it collects. On a busy work day it was found that the average employee is touching ten items per minute. Also, janitors are expected to clean toilets regularly, but are often asked not to disturb workspaces. The study found that bacteria can grow 19 to 31% a day in a workstation if nothing is done. Employees who frequently wipe down their areas with anti-bacterial products were found to reduce the bacteria count 99.9% in two days’ time. The study was conducted in Tucson, San Francisco, New York, and Tampa. Tucson was found to have the cleanest desks, and New York was found to have the dirtiest. The researchers believe Tucson’s desert climate is not as inviting to bacteria. The most germ-ridden surface in Tucson was, in fact, the water fountain handle, demonstrating that moisture is an important factor. Clorox also speculates that in “busier” cities employees are more likely to eat in their workplace, which increases the risk of bacteria spreading. I don’t want to create a paranoia about touching anything, but we can go a long ways to increase awareness about the benefits of washing your hands or wiping down your desk. Extremely interesting article post. Your article is very interesting. I enjoyed this post. This post is good! I have to say that after continually reading poor as in, same old material, little quality content, etc. article posts on other sites, it’s nice to actually read something that has some thought put into it. It’s a pleasure to read well written blog posts, especially after continually seeing rehashed %$!# that writers and bloggers are throwing out nowadays. It’s always nice when I come across content that actually has value, I’ve been seeing a ton of subpar writing attempts lately. Anyways, thanks again and I’ll check back regularly to see what else you have to offer. I’ll check back in the future to see what else you have up your sleeve. Keep up the fantastic work! BTW, I like your site design, but your header image was only loading half way for me. P.S. Your header is messed up a bit in IE. The problem could be on my end but I thought you might want to look into that.